Everyone wants their dreams to come true. Well, I don’t. If my dreams came true, the world would be a very, very strange place. Suddenly Matt Damon shows up on Segway and battles it out with Vik Sohal who’s riding a giant pygmy hippo that shoots lasers out of its eyes. And my car turns into a giant Dorito, so I eat it. 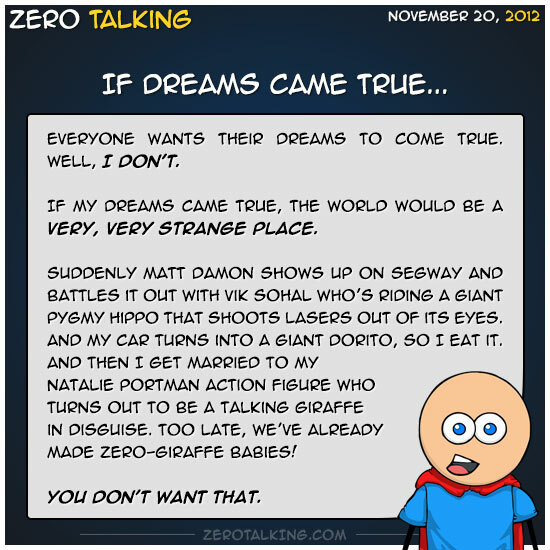 And then I get married to my Natalie Portman action figure who turns out to be a talking giraffe in disguise. Too late, we’ve already made Zero-giraffe babies!